Photographer John Wesson on the landscape and people of Kerry that captured his imagination more than 30 years ago. I am lucky enough to have had a long association with Kerry, having returned on a regular basis for nearly 30 years. Each year I spend more and more time in “The Kingdom.” In most of Kerry, and certainly in the south and west, you are never very far from the sea or from a mountain. The county rises rugged and mountainous out of the Atlantic Ocean. Cliffs and steep slopes abound, and safe, sheltered access is limited. In the north, the land is sweeter, less acidic, and perfect for dairy farming. The green fields of Ireland are green for a good reason: rain. It pours for days on end, sometimes for weeks. With the temperate oceanic climate, grass grows all year round, and conditions are perfect for rearing cattle and for milk production. Kerry’s main export, food, is only possible because of copious amounts of annual rainfall. 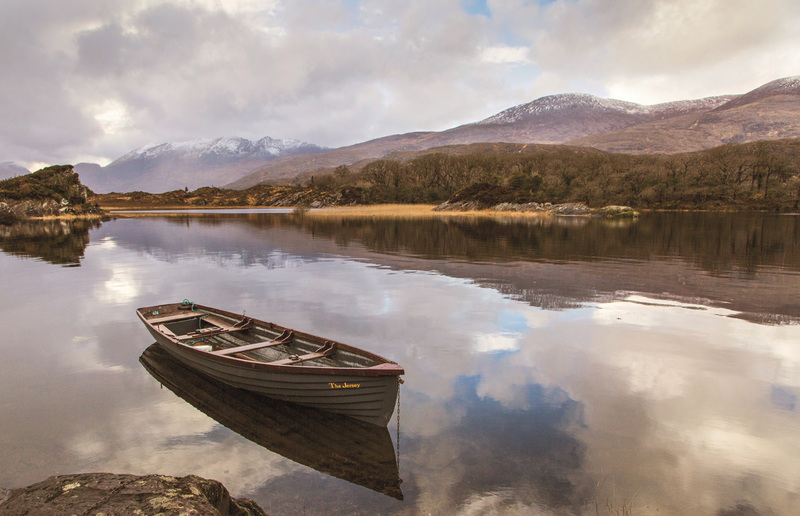 Most visitors come to Kerry to experience its raw beauty; they do not come for the weather. But a period of high pressure can lead to days of settled weather, and there are those who are lucky to have their visit coincide with fine weather. If you are interested in landscapes and seascapes, Kerry is the perfect county. It is a joy to experience the astonishing and continually changing Atlantic light at first hand. My favorite times of the year to capture it are spring and autumn. This is when Atlantic showers blow in, bringing dark clouds that contrast with low, clean sunlight, illuminating the landscape in a way that has to be seen to be believed. It is possible to see more rainbows in a single morning here than in a whole year elsewhere. Wintertime brings low light all day, picking out the landscape in rich, fine detail. The usually quiet beaches are now completely empty. Huge Atlantic rollers come crashing in, and the cold weather puts white hats of snow on the mountaintops. These mountains really do look remarkable; the golden hues of the dead, dried grasses and heathers look wonderful against a cold, blue sky. It is often asked how many shades of green are there in Ireland. I would also like to know how many shades of gold there are on a Kerry mountainside in winter. Due to Kerry’s westerly position, you will notice that it gets dark later than you might suppose, allowing plenty of time for a “sundowner” while you admire the receding light … and take another sunset picture. Does the world need any more sunset pictures? I hope so. There is a lot more to Kerry than just scenery. Its people are fierce and proud of all things “Kerry,” be it sport, culture or produce. The locals are friendly, enquiring, helpful people who will direct you, quiz you and learn all there is to know about you – all in no more time than it takes to order a Guinness or fold away a map. They are delighted to have so many people visiting from around the world, are interested in where they live and are always curious, given the chance, to find out where visitors come from and what they do for a living. A ten-minute chat with a local will most likely have you both informed and laughing in a way that simply does not happen elsewhere. I have had a lifelong interest in photography, first picking up my dad’s camera as a schoolboy and taking it on fishing trips to record the catch. I still have some black-and-white prints of those unfortunate fish. Cycling the lanes of Derbyshire looking for new places to fish or explore, my friends and I acquired an interest in the countryside in all its glory, flora and fauna – a passion that I still have today. Later, as an engineering apprentice, I bought my first SLR camera, a 35mm Canon FTb, along with a 50mm lens. It cost me a month’s wages! It was a great camera that I used for years, and still own. I travelled the length and breadth of the British Isles with it, on various motorcycles. These days, I am still using Canon cameras, both full-frame and APS-C, and my subject matter is much varied. My favorite subjects are Irish seascapes and landscapes; however, I am interested in everything from weeds to weddings. St. Finian’s Bay: The cows are about to get wet again as yet another shower blows in from across the bay. The “white horse” waves on the west coast of Ireland can be enormous, having had more than 3,000 miles of uninterrupted ocean in which to travel and grow. The prevailing westerly winds that propel them also result in this air being the purest in Europe, if not the world, thanks to the vast Atlantic Ocean between here and the eastern seaboard of America. 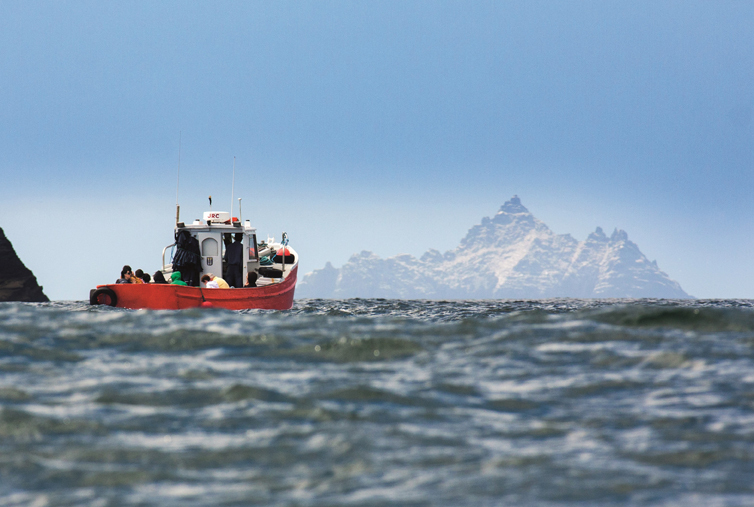 The Skelligs: Boatman Eoin Walsh on board the Agnes Olibhear heads out of the Portmagee Channel with another group of lucky passengers. I first traveled out to the Skelligs nearly 30 years ago with local boatman Dan McCrohan on board his famous wooden boat, Christmas Eve. I have returned many times sense, but that first trip, on a beautiful blue day in June, left an impression on me never to be forgotten. 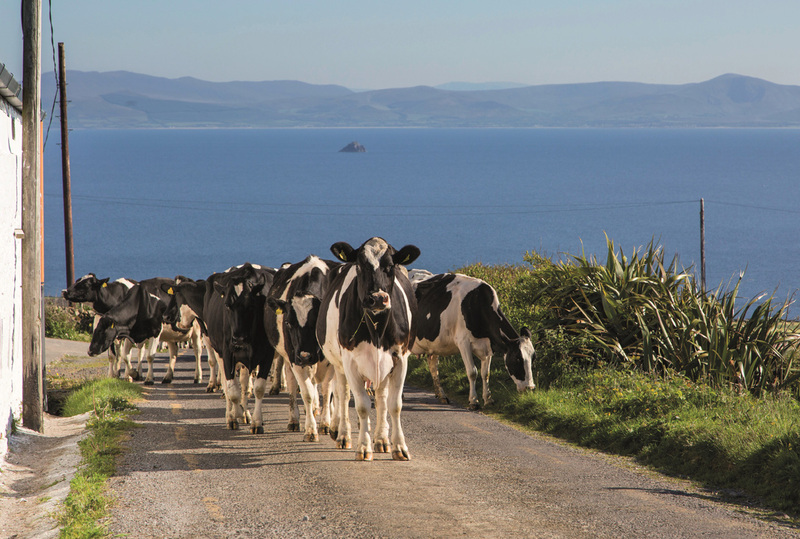 North Kerry: Friesian cattle heading back to their fields after milking. Less mountainous than the county, from the Shannon to Tralee is lush, rolling, verdant green countryside. History, heritage, culture, and scenery are all around you, with many Blue Flag beaches for bathing, surfing, and angling. Kerry’s “gold” is found here – be it the “written word” or the finest dairy produce in the world. Killarney: The Upper Lake. Situated on the shores of Lough Leane, Killarney is the tourist capital of Ireland and centrally placed within the country. The breathtaking Magillicuddy’s Reeks, the Gap of Dunloe, and the Black Valley are all nearby, and there is hiking, angling, golf, cycling, pony-trekking, wildlife (and photography!) all on one doorstep. Killarney: The McCarthy Már Castle on Lough Leane. The Killarney National Park sits on the very edge of town, along with Muckross House, Muckross Abbey, and Ross Castle, situated in ancient woodlands. Surrounding the lake, too, are what are often referred to as “famine cottages,”dwellings that were abandoned in the mid-1800s when the potato crop failed and famine gripped rural Ireland. 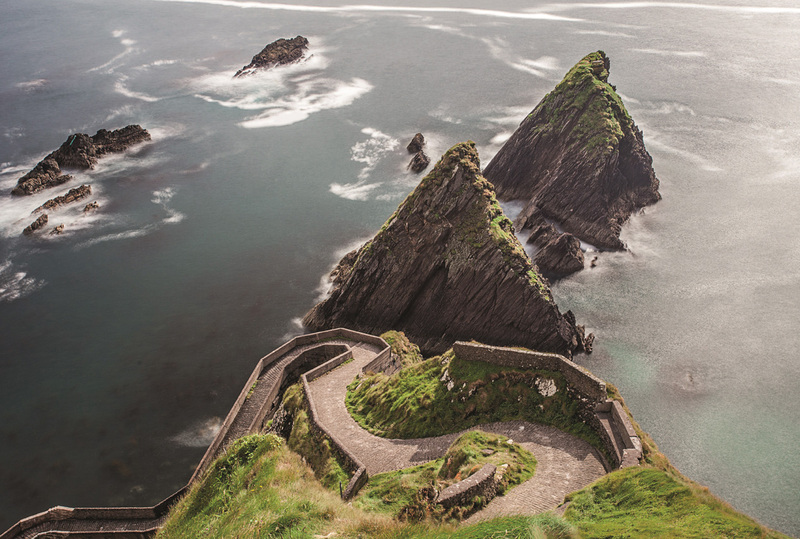 Dunquin: Twists and turns down to Dunquin Pier. There is hardly a more idyllic place to work than at the top of this windy road down to Dunquin Pier. There, a woman named Sibéal sells boat rides out to Great Blasket, the only one of the Blasket Islands open to visitors. Perched high on the cliff above the pier, Sibéal’s shed looks out over the Blasket Islands and the Atlantic Ocean. 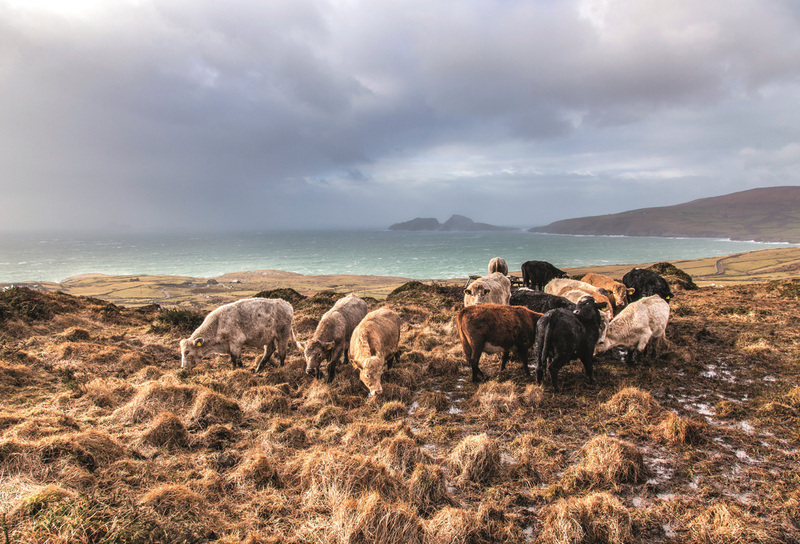 Excerpted from photographer John Wesson’s Kerry: The Beautiful Kingdom (O’Brien, 2017), a stunning book of photographs with well-thought-out captions that are full of information about the landscape and people of Kerry located in the southwest of Ireland in the province of Munster. Kerry faces the Atlantic Ocean, is bordered on the north by the River Shannon, and is one of the mountainous regions in Ireland. Known for its rugged beauty and friendly people, the county is featured in several Hollywood movies, including Harry Potter and the Half-Blood Prince, Ryan’s Daughter, Star Wars: The Force Awakens, and this fall’s Star Wars: The Last Jedi. For more information see obrien.ie.